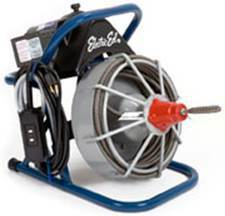 Electric Eel 3” x 100’ Auto Feed Sewer Auger drain cleaner. 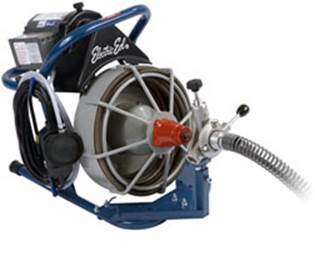 The Model RF Drain Cleaning Machine features a 2-way auto cable feed that advances and retrieves cable with the push of a lever, while a cable guide spring keeps hands off rotating cable for added safety. 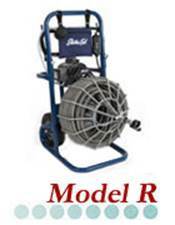 The Model RF drain and sewer cleaning machine cleans 3” – 6” diameter lines and runs either 5/8” or 3/4” diameter “Tri-Max” inner core cable (the toughest cable in the industry) in lengths up to 100 ft. The Model RF utilizes the same quick connect “snap lock” tool fittings as the Model C and standard Model R. Reinforced open cable cage for quick inspection and cleaning. This rugged and reliable unit is ideal in situations with limited working space.